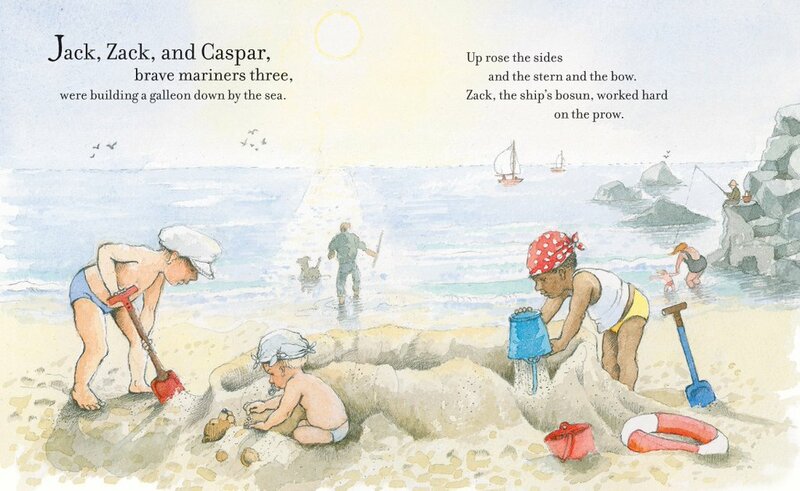 In 2011 we first met Jack, Zack and Caspar, three boys with a creativity that was surpassed only by their imagination. 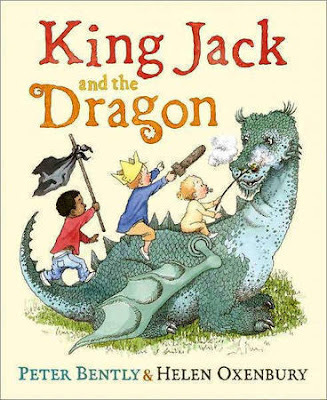 In King Jack and the Dragon, written by Peter Bently and illustrated by the marvelous Helen Oxenbury, the three spend the day building a castle then defending it from dragons and giants until it's time to go home. 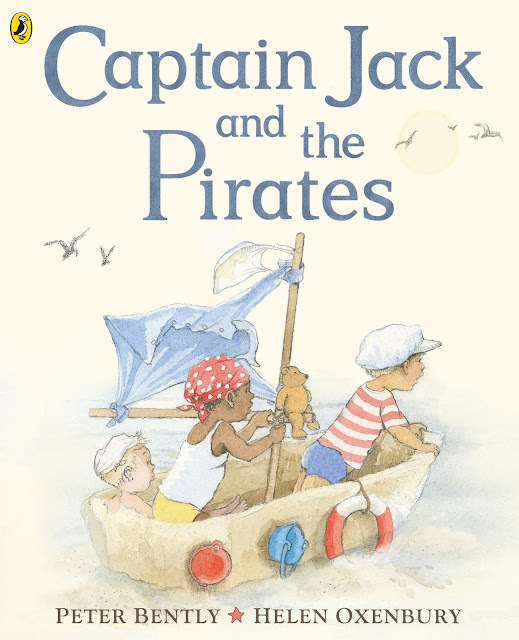 In Captain Jack and the Pirates, Jack, Zack and Caspar are on the beach, "brave mariners three," building a "galleon down by the sea." Sand, sticks and somebody's shirt come together and the three set sail. They head out to sea, "hungry for glory and enemy booty," but a tropical gale scuppers their plans. 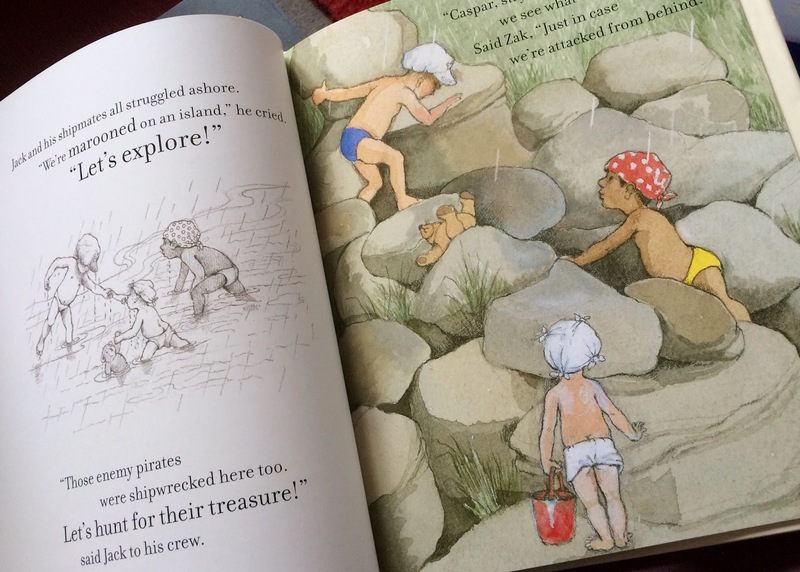 Abandoning ship, the three agree to explore, but must rescue little Caspar when he is captured by the pirates. They slip into the hideout and find treasure galore! The pirate hideout is actually cabana where mom and dad have been preparing afternoon tea, including three ice cream cones and a happy ending. Bently's rhyming text can almost be sung like a sea chanty and the adventure that he creates for the boys - imagined and read - is wonderful. Oxenbury, a favorite of mine, is a gifted illustrator who is especially skilled at bringing preschool aged children and the natural world to the page. 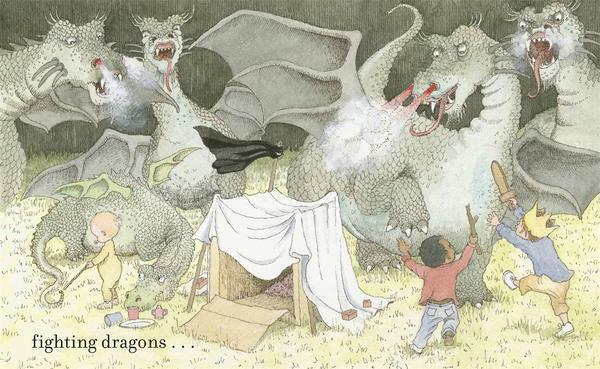 As in King Jack and the Dragon, the illustrations alternate between color and monochrome, Oxenbury's lush watercolor and pencil perfectly balance the real world experiences of the boys and the imaginary world that they create. While it was almost five years between books, I will happily wait for a third adventure with Jack, Zack and Caspar!